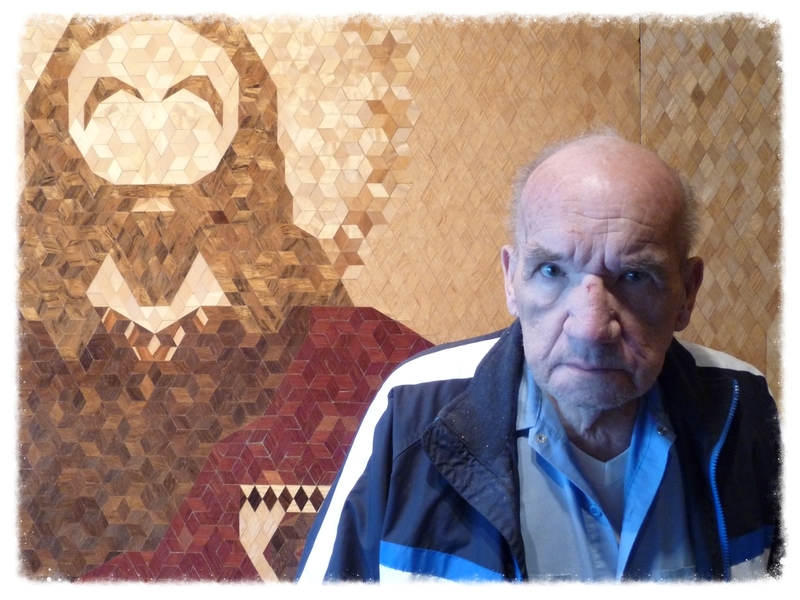 I had an extraordinary experience in May that involved my introduction to an extraordinary man who told his extraordinary story over the course of 30 years and 30 panels of marquetry that stretch across 120 linear feet of gallery space. When my niece, Allyson, invited my Mother, my sisters, my daughter and nieces to join her in Chicago for a viewing of thirty 4 x 8 wood panels entrusted to her, I was excited, not just to see my family, but also to witness the majesty of a homeless man named Ed Lantzer. Ed’s story is a visual experience that can be seen and read. The book that tells his story is called THE MURAL WRITER: The Unlikely Story of an Outcast Who Fulfilled an Extraordinary Purpose, by La Shelle Van Houten. As a woman who has been leading book discussions for 20 years, I am always interested in reading anything I can get my hands on, any old or new books that I might select for our book groups to read or simply to recommend to my family and friends. This is one such book. In THE MURAL WRITER, Van Houten tells the story of a homeless man, a man often called a half-wit, a man who was told he was undeserving of love. Ed Lantzer had a family that he walked away from so that he could fulfill a higher purpose and answer God’s call. His gift was in marquetry, creating spiritual tableaux cut out of millions of ½” diamond-shaped pieces of wood. La Shelle Van Houten is an artist and writer who, she said ,”was one of many people God placed into Ed’s life to help him complete his job so that he could become ‘The Mural Writer’ for Him.” There was a group of people who, La Shelle claims, “God sent at just the right time and became Ed’s relay team, each handing off the baton to the next when it was time.” My niece, Allyson Cayce, was one of those very special people who was handed the baton and who lovingly and diligently and against uncanny odds found a home for Ed’s murals in an unlikely place, in an abandoned pasta warehouse in Libertyville, IL. Allyson believed in Ed’s spiritual journey through his labors and invited the public to witness what he created, free of charge. Since Ed was homeless for much of his life, he did not want to charge people to see his panels. Allyson, likewise, with the help of generous friends and strangers, was able to open the Fould’s Gallery and was able to provide heat and lighting through silent donors. I urge you to read THE MURAL WRITER and, if you ever have the opportunity to be in Chicago, stop in at Carmel Catholic High School in Mundelein, IL to view Ed Lantzer’s panels in their new home, at the next passing of the baton. I guarantee that you will be transported by his story. Cross Reference: Books by C.S.Lewis and A MAN CALLED OVE by, Fredrik Backman. In the Foreword to La Shelle Van Houten’s book, David Crouse refers to Ed as being “cantankerous”. Both Ed and Ove may have cornered the market on "cantankerous" as well as the word “curmudgeon”.